Should you Remodel or Renovate Your Kitchen? Why should you remodel or update your kitchen? At RDS, our designers are often asked about kitchens and how we can help our clients make their kitchens more efficient, updated, and current. What should you be thinking about if you are contemplating a remodel of your kitchen? Your kitchen may have worked for you in the past, but now it appears to be outdated. It might be in good shape, but not for your life now. Maybe the tiles are cracking or worn, the countertops are out of style, or the cabinets are broken or too small. Are the appliances old and not working for your family’s needs? It might need a new patio door, or skylights to add light to the room. Do You Need to Change the Space or Function? Counter space, cabinet space, and work space are some of the biggest reasons to update your kitchen. Most of us want more room for cooking, storage, and family work or gathering areas. You might want to increase the area so that there can be more than one cook, or to set up a computer work station. An island so that you can have a quick meal together might be a wanted change. Are You Dreaming of a Gourmet Kitchen? You love to cook, read and try recipes, and love state of the art appliances and gadgets. Your main reason for a remodel is to create your dream kitchen so that you can prepare great meals and entertain. Is Storage or Lack of it an Issue? You don’t have room for your appliances, dishes, serving ware, and pantry staples. Increasing your storage space might be the impetus for remodeling. A walk in pantry, bigger cabinets, and reworking your existing storage spaces, are all good reasons to remodel. Do You Need the Kitchen Open to More Rooms in the House? Everyone ends up in the kitchen when entertaining and if the kitchen is closed off, this doesn’t work. You might need to open up the space, build a large island, rework the flow, and create entertaining spaces. 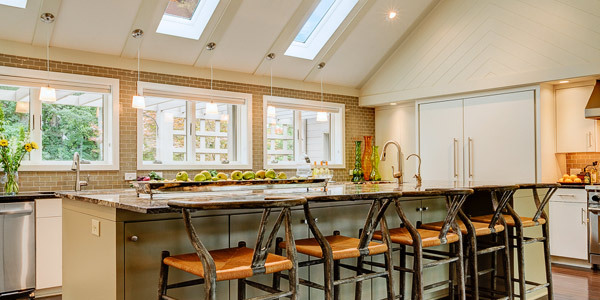 Whatever your reasons are for remodeling your kitchen, RDS, your leader in kitchen designs and renovation plans, is here to answer your questions and work with you to design your perfect space.